Kabuli palaw (Persian: کابلی پلو) or Qabuli palaw (قابلی پلو) is an Afghan and Pakistani dish, a variety of pilaf, consisting of steamed rice mixed with raisins, carrots, and lamb. 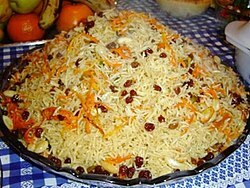 It is one of the most popular dishes in Afghanistan and is the national dish. Qabel'i Palaw means 'Excellent/outstanding rice' in the Persian language and not rice from Kabul, as some might think. Kabuli palaw is made by cooking basmati or long grained rice in a brothy sauce (which makes the rice brown). This dish may be made with lamb, chicken, or beef. Kabuli palaw is baked in the oven and may be topped with fried sliced carrots, raisins, orange peel strips, and chopped nuts like pistachios or almonds. The meat is covered by the rice or buried in the rice mixture. Kabuli palaw is popular in other countries, including Saudi Arabia, where it is also known as Roz Bukhari (Arabic: رز بخاري), meaning "Bukharan rice"; which is a simpler form introduced by Afghan immigrants living in Saudi Arabia. ^ Ali, Tanveer (31 July 2012). "Everything You Need To Know About Afghan Food". foodrepublic. Retrieved 2014-02-19. This page was last edited on 22 April 2019, at 12:28 (UTC).